Every day, A wakes up in a different body. A has gotten used to it over the years, and has learned not to try and form attachments because after the day is over, A will be in a new body. Everything changes when A wakes up as a boy named Justin, and meets Justin’s girlfriend Rhiannon. A falls in love with her, and for the first time wants to stay in one place every day. This was such a beautiful story! I really loved the message it sent–that love can transcend all boundaries. A is not really male or female, since he/she wakes up in a different body each day regardless of the gender. Since A has never spent an entire life as either male or female, A is able to see all people as equal, regardless of their gender or sexual orientation. A doesn’t find it weird to wake up in the body of a homosexual person, because to A that is no different than being in the body of a heterosexual person. A believes that love is love, and boundaries like gender shouldn’t matter. This was really a wonderful message to send because there are not enough people in the world that can think like this, and hopefully this book will encourage people to look past the differences. The story itself was very sad. A’s consciousness moves from body to body each day, always staying in the same general area of the country and always in the body of someone A’s actual age. A has never had real parents or siblings, has never had real friends to grow up with, and was never able to have an actual romantic relationship with anyone. When A meets Rhiannon and sees how her boyfriend Justin treats her, A finally finds a reason to stay in one place. A tries to convince Rhiannon that she deserves so much better than Justin, who doesn’t really notice her anymore. At the same time, A tries to figure out a way to have a relationship with Rhiannon, which seems nearly impossible since A wakes up as a different person each day. I had mixed feelings about Rhiannon herself. She definitely grew throughout the book from being a timid girlfriend in a toxic relationship to realizing that she deserved more, but sometimes the way she treated A annoyed me. I understand it’s hard for her to try and love a different physical body each day but it’s not like it’s easy for A to wake up in a different body each day and try to convince Rhiannon that A is the same person. A is a fantastic character though, and I really admired the way A was willing to do anything to be with Rhiannon. Overall, Every Day is a beautiful story about a love that transcends all obstacles. I highly recommend this to anyone, even though the ending nearly made me tear up. 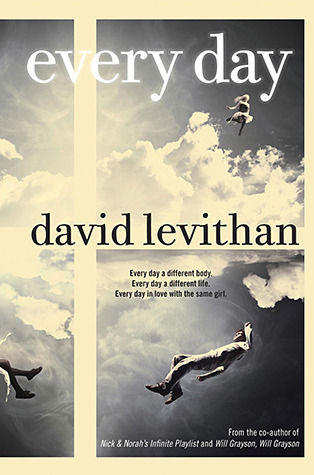 Every Day was released on August 28, 2012. I really want to read this! It’s not out here (in Ireland) until the end of the month though! Great review!